Getting going, I’ve roughly outlined what the story is about and an initial plot / story arc. Really I should have spent time refining plot, characters and solving key plot points, after-all I’ve been reading Scott McCloud and Alan Moore’s books and essays on writing for comics to get up to speed. BUT… I got impatient and started doodling, creating a draft first page of artwork to get me in the mood. I think I’ve made a couple of mistakes – I did the art of A4 heavyweight cartridge paper – have now purchased some A3 Bristol board, which means this page may get done again. I started with penciling and when happy with that moved straight to inking directly on the pencil work. Doing most of this on the sofa in the evenings shows – some of the lines not being as true, clean and straight as they might have been if I’d used a desk! Realising that the comic world has moved to digital – I’ve started dabbling with scanning in artwork and using Inkscape to do the inking and potentially colour layers. Concluded I need to get in some practice but should result in cleaner lines (even on the sofa). Also suspect this would be easier with a graphic tablet so now considering getting a Wacom Bamboo Pen and Touch, although I also suspect that an A5 tablet may eventually turn out to be too small, but will start there. 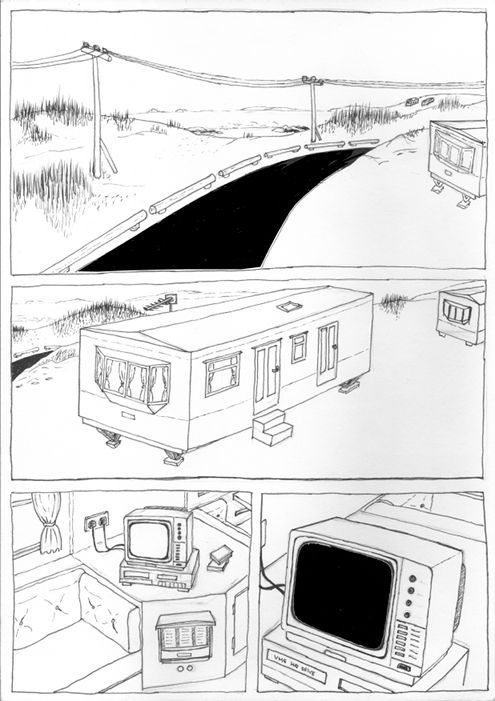 So here’s the first draft of the first page – mostly location setting – coastal, caravan and introducing the first two plot device elements – 3 phase power lines and an old analogue portable telly and video. The pencil still visible as I’m now going to try and tidy this up digitally and potentially remove the pencil and ink base. What is 'Catastrophe Noir' ? 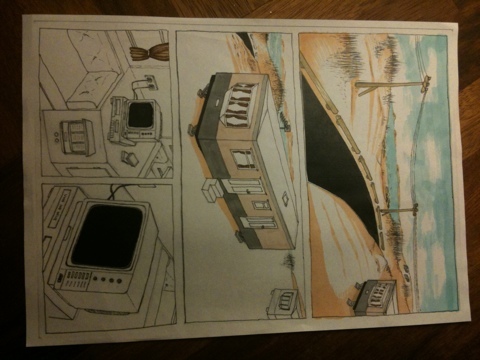 Catastrophe Noir is the first graphic novel project by Paul Smith. Assisting with clean-up from the worlds first major oil tanker disaster the Torrey Canyon leads a local small-time property developer and pioneer scuba diver to discover oil wells off the coast of Cornwall. How little the local residents realise the pace of industrialisation and urbanisation that would be visited upon the far south west of England and the price to be paid for their new found affluence. How little the residents realise that the oil was only found following an un-savoury agreement between men and unspeakable ancient creatures that have been making visits to the shores of mankind in search of a means to extend their own dwindling genetic lineage. The story follows the un-conventional friendship between Catherine Black and Heath Moore as they are drawn into discovering the truth behind the affluence and prosperity that has been brought to the far reaches of Cornwall. This brings them to the attention of the dominant, pervasive and opaque KernOyl organisation. KernOyl being the sole organisation that owns the ‘Scilly fields’ flourishing following the approval for Oil extraction on a massive scale by the successive 1970’s Labour governments who needed to avert successive energy, social and financial crises. A government only toppled in 1983 by Margaret Thatcher after the Falkland islands are lost to Argentina. The story unfolds in several time-lines from near present day, back to the late 60,s and early 70’s and from the perspective of a variety of characters – at least one of whom has more than one perspective to contribute. The story is currently planned to include locations, ideas and plot points based around – Goonhilly Earth station, the Minack Theatre, Barbara Hepworths sculpture garden, signal interference, Carl Sagan, gender identify, decoding of the Rosetta stone, deception, hypnosis, sacrifice, impregnation and incubation, pagan worship, tin-mines, Cthulu mythos, burlesque, scientific rationalism and environmental catastrophe. Catastrophe Noir is a story of discovery, love, damnation, enchantment, horror and redemption. Actually, it’s like the ‘Shadow over Innsmouth’ but narrated as an episode of Coast.